FACT CHECK: Is This the Space Shuttle Leaving Earth's Atmosphere? A photograph taken from the International Space Station shows a Space Shuttle leaving Earth. 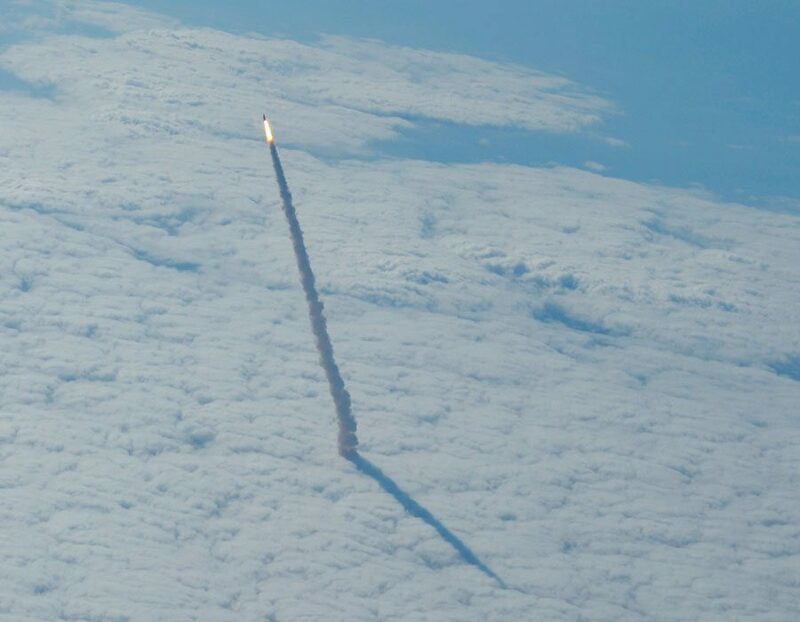 A photograph shows the Space Shuttle ascending above the clouds. The picture was not taken from the International Space Station, and it has been modified with photographic effects. While this picture does depict a real event, the image was not taken by a camera on the ISS and has been modified with photographic effects. What’s that rising from the clouds? The space shuttle. If you looked out the window of an airplane at just the right place and time you could have seen something very unusual — the space shuttle Endeavour launching to orbit. Images of the rising shuttle and its plume became widely circulated over the web shortly after Endeavour’s final launch. The above image was taken from a shuttle training aircraft and is not copyrighted. Taken well above the clouds, the image can be matched with similar images of the same shuttle plume taken below the clouds. Hot glowing gasses expelled by the engines are visible near the rising shuttle, as well as a long smoke plume. A shadow of the plume appears on the cloud deck, indicating the direction of the Sun. According to NASA, the ISS circles the globe at an altitude of approximately 220 miles (about 350 kilometers), while the shuttle training aircraft which took this photograph was most likely traveling below 35,000 feet.